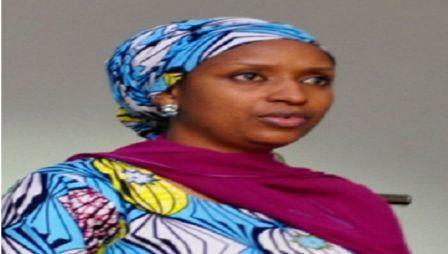 The Managing Director, Nigerian Ports Authority (NPA), MsHadizaBala Usman hascommended President Muhammadu Buhari over the release of 21 Chibok girls. She also commendedthe Federal Executive Council (FEC) for the negotiation that led to the release of the girls. Ms Usman, who shot to national prominence in 2014 when Boko Haram insurgents kidnapped 276 girls from their secondary school in Chibok, Borno State, said she was happy over the efforts put in place by the Federal Government to secure the release of some of the girls. She urged Nigerians to always appreciate all the positive efforts put in place by the government to boost security and revamp the economy. The NPA helmsman said the release of the girls is a fulfillment of Buhari’s and the All Progressives Congress (APC) campaign promise to secure their release and reunite them with their parents. While acknowledging that the release of the 21 girls was a good omen that the country would overcome its security and other challenges, she urged the Federal Government not to relent in its efforts to secure the release of the remaining girls. She reaffirmed her belief in the President Buhari led-administration in ensuring an end to the uncharitable activities of the Boko Haram sect and other similar gangs across the country. She rejoiced and showed unreserved appreciation to the parents of the released girls, her colleagues in the Bring Back Our Girls Group, the Nigerian Armed Forces, the international community and other non-governmental organisationsfor their support and persistent roles before and after the rescue of some of the girls. Ms Usman, apart from assuring Nigerians and the international community that President Buhari is committed to ensuring the safe release of all the abducted girls, she called for collaboration and peace talk that will lead to the release of all the girls.